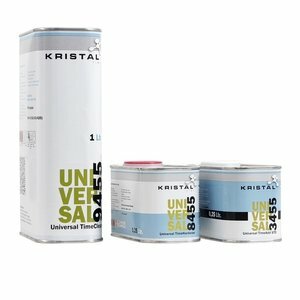 KRISTAL Universal TimeClear 3.0, is an easy-to-use chemical resistant, non-yellowing, finishing clear finish. Air-drying and force-drying. For application as a Clear Coat over KRISTAL AquaGreen WB and other Metallic Basecoat Series. Suitable for passenger cars. Fully cures with only 20 degrees Celsius. Dust-dry after 10 - 15 minutes. No heating of the spray booth. Applicable for 1 panel up to a whole car overspray. Excellent clearness. Dry to assemble after 2,5 hours at 20 degrees Celsius. Based on Automechanika Innovation Award winning technology.